Decorative Life: Many months to years, depending on use. Not sensitive to chlorine levels normally found in irrigation water. Perform equally well when grown in dark or clear pots. The postharvest quality of P. obtusifolia is not affected by the ratio of nitrate to ammonium fertilizers used during production. The use of growth retardants like ancymidol to make plants more compact can improve postharvest longevity. Growing mix compaction during production can decrease postharvest quality and longevity. Members of the Piperaceae (pepper family). One common family member is the spice pepper, which is not the same as the green and red peppers often grown in vegetable gardens. Leaves are heart-shaped, succulent, with rippled or wrinkled texture, up to 2 inches across, generally form a clump. Flowers are minute. Plants seldom get over 12 inches tall. Flowers are not fragrant and are not the main attribute of this species, the foliage is what makes this species interesting. 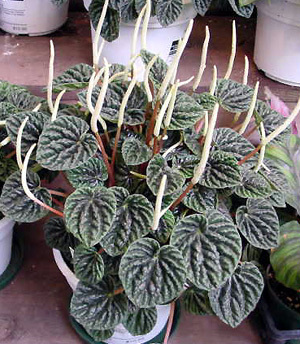 Peperomia means pepper-like. It is from the Greek “peperi” (pepper) and “homoios” (resembling), referring to its resemblance to a similar genus Piper from which one obtains peppercorns. A group of very common, succulent plants found in the home or office environment, generally of small stature. Its waxy leaves can slow down non-stomata water loss (cuticular transpiration), especially under low light levels when stomates are mostly closed. Main stay cultivars include ‘Marble’, ‘Variegata’ and ‘Golden Gate’, the latter having dark green irregular margins, a band of ivory and the center light silvery green.